Make the world a better place and save on your taxes! You sell appreciated securities, give the cash to a charity, like Hope and Healing International, and receive a tax receipt for the amount. BUT you’ll pay capital gains on the appreciated amount. 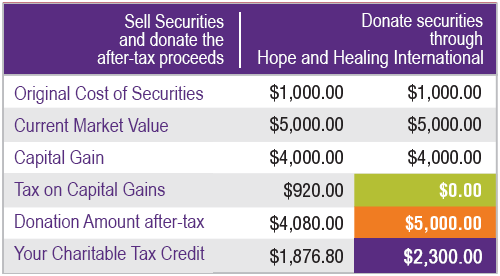 Here’s a better way: If you donate appreciated securities directly to Hope and Healing International, you’ll not only be exempt from paying capital gains but you’ll get a tax receipt for the full value of the appreciated securities. A win for you – no tax! 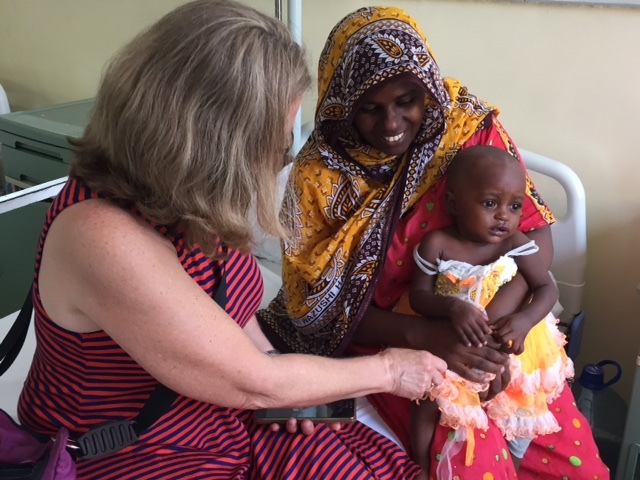 And a win for the children and families Hope and Healing International serves – a more generous gift! It’s a win-win! This chart assumes a 46% marginal tax rate. We’ve used it to illustrate, but note that it’s not intended to be legal or financial advice. We recommend that you get professional advice before deciding on your donation strategy. 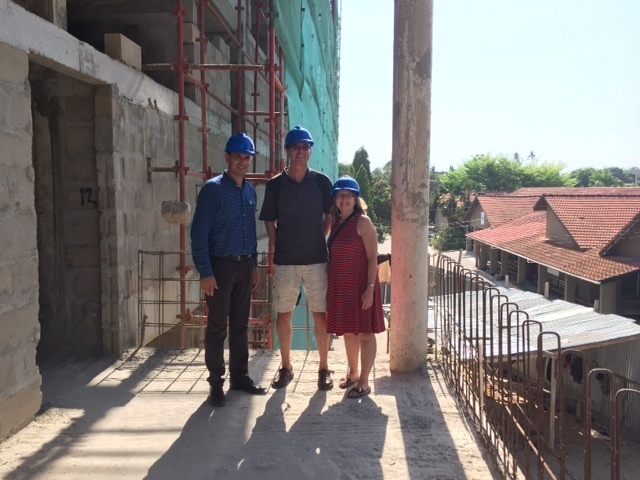 Erwin Telemans, CEO of CCBRT (left) with Ben and Mary Sybring. Ben Sybring knows a well-run hospital when he sees one. That’s exactly what he saw at Comprehensive Community Based Rehabilitation (CCBRT) in Tanzania. Ben first heard about CCBRT through a brochure left on his daughter Michelle’s kitchen table. This unique hospital piqued his curiosity enough that he asked Hope and Healing International staff lots of questions. Then he accepted an invitation to tour the hospital during a vacation to Tanzania. As the VP of Corporate Services at Holland Bloorview Kids Rehabilitation Hospital, Ben has the expertise to understand the best practices for how a hospital must operate to best serve children with disabilities. And what he saw at CCBRT impressed him. It was organized. Efficient. He was also moved by the children with cleft lip and palate. Treating this condition is costly but life changing as he learned at Bloorview. Ben’s wife, Mary, an RN in a neonatal intensive care unit (NICU) in Toronto, was equally impressed. After returning from the trip they felt confident that their previously pledged gift of securities aligned well with what they stood for as a family. The 2006 Federal Budget reduced to zero percent the capital gains inclusion rate for gifts of publicly-listed securities to public charities. You can give appreciated securities to Hope and Healing International and pay no taxes on the capital gains. You will also receive a charitable receipt for the full fair market value of the securities. For more information, please feel free to call our Finance Department at 1-800-567-2264 ext 250, or complete the information form below. Are you a current Hope and Healing International donor? 1. What is a gift of securities? A gift of securities is a ‘Gift in Kind’ where you transfer the title of securities that are listed on an approved or designated stock exchange to the ownership of a public charity like Hope and Healing International. This is almost always done electronically. 2. Where can I read about gifts of securities on CRA’s website? 3. Who at Hope and Healing International can answer my questions about gifts of securities? 4. What are the steps to making a gift of securities? Hope and Healing International’s finance department will contact you and will let you know the gift has reached Hope and Healing International’s account and the value that will be used for the charitable receipt. 5. How long does it take to make a gift of securities? Gifts of stock/shares take a few days. Gifts of mutual fund units can take up to several weeks. 6. What publicly-listed securities can I give to Hope and Healing International? a prescribed debt obligation (e.g., government savings bond). 7. What is Hope and Healing International’s brokerage account information and who can my broker contact there? Please note that the brokerage account at RBC Dominion Securities is held under Hope and Healing International’s legal name: Christian Blind Mission International. 8. Why is giving a gift of appreciated securities instead of cash the most tax-effective way to fund a gift? What tax benefits could I receive for giving a gift of securities? Normally, if you sell securities that have capital gains in them (appreciated securities), you have to include 50% of the capital gains in your tax return and pay taxes on them. If you gift appreciated securities to a public charity like Hope and Healing International, you don’t have to include any of the capital gains in your tax return. In effect, the growth in the value is tax-free for you. The 2006 Federal Budget reduced to zero percent the inclusion rate for gifts of such securities to public charities. This means there are no taxes payable on the (sometimes huge) capital gains. You also receive an official charitable donation receipt for the full value – that is, the fair market value – of the securities. You can use the charitable receipt to off-set taxes payable on your other income. You can carry forward any unused charitable receipt amounts for five years. You can share the charitable receipt with your spouse but not the tax exemption on the capital gains. Hope and Healing International recommends you consult with your financial advisor and/or accountant when making gifts of securities. 9. How will Hope and Healing International determine the value of my official ‘Gift in Kind’ charitable receipt? Hope and Healing International’s official ‘Gift in Kind’ charitable receipt value will be determined by the closing value on the date the security is transferred into Hope and Healing International’s brokerage account. The closing day value per unit/share times the number of units/shares determines the fair market value or full value of the gift. You will be notified by Hope and Healing International staff that the gift has been received and what the total value of the official donation receipt will be. The ‘Gift in Kind’ donation receipt will also indicate that you have not received any advantage. 10. What does Hope and Healing International do with the securities I have given – do they hold them? Hope and Healing International’s policy is to immediately liquidate or sell the gifted securities after they come into Hope and Healing International’s brokerage account. The money is used right away to help carry out Hope and Healing International’s activities. 11. Can I designate my gift to a particular item or project or program of Hope and Healing International? Yes. At the time of your gift, Hope and Healing International staff will discuss with you the particular items, projects or programs of Hope and Healing International to which you can designate the proceeds. You can also direct Hope and Healing International to use your gift for wherever needed most at the time. 12. What do people say that have made a gift like this? We recently donated a gift of securities to Hope and Healing International. By donating securities (rather than donating cash), we were able to make a donation of significantly greater value to Hope and Healing International at the same after-tax cost to us, due to the fact that the Canada Revenue Agency provides preferred tax treatment on gifts of securities, such as shares of stock. In addition, because the stock shares that we donated had been obtained through the exercise of some employee stock options, additional tax benefits were realized on these transactions. Both of these factors allowed us to increase the value of our donation to Hope and Healing International without incurring any additional out-of-pocket (after-tax) cost. Hope and Healing International was then able to use the funds obtained from our gift of securities to purchase an A-scan unit for the eye clinic at Good Shepherd Hospital in Swaziland, as well as a significant number of intraocular lenses. The A-unit enables the precise selection of the intraocular lens that is needed for each patient in the approximately 1,000 cataract surgeries that are performed annually by Dr. Jonathon Pons and his team at this Hope and Healing International-supported clinic, thereby restoring sight in those who had not been able to see. The staff at Hope and Healing International and RBC Dominion Securities were very helpful in guiding us through the process of making the gift of securities and in ensuring the smooth execution of the related transactions. It may also be worthwhile to obtain the advice of a financial advisor before making a gift of securities, particularly for those who are planning to donate shares derived from stock options, as there are some important timing requirements that must be met in order to obtain all of the available tax benefits from CRA. We were privileged to have had the opportunity to host Dr. Pons and his wife Helen for dinner at our home during their recent visit to Canada, and were inspired when we learned more about the incredible work that he and his staff are performing in the most challenging of circumstances. We are looking forward to visiting Dr. Pons at the Good Shepherd Eye Clinic next spring as part of an InSight tour group, and to learning more about Hope and Healing International’s work in Swaziland. It was very gratifying to learn directly from Dr. Pons about the impact of our donation. The purchase of the A-scan unit would not have been possible without the favorable tax treatment that was made available to us because we gave a “gift of securities”. We are thrilled that our gift of securities to Hope and Healing International is enabling the gift of restored sight for so many people. 13. What happens when I exercise my company stock options to fund my gift to Hope and Healing International? When an employee acquires a publicly-listed security under an option granted by the employer and donates the security to Hope and Healing International within 30 days (and within the same taxation year), the employee may be eligible for a special deduction, the general effect of which is to exempt the associated employment benefit from tax. The donation must take place in the same year in which the security is acquired. 14. What about donating flow-through shares to Hope and Healing International? Hope and Healing International’s policy is to only consider a gift of flow-through shares once they have become publicly-listed mutual fund units. Flow-through shares are issued by companies in the energy and mining sectors to raise funds for exploration. The flow-through shares can begin as units of a limited partnership which are eventually converted to listed units of a mutual fund or the investor may purchase shares directly. The company allocates or ‘flows through’ the deduction of expenses that the company can’t use to the investor. The investor can then deduct an amount up to his original cost against his other income. His cost base of the unit/share could be reduced to $0. The 2011 Federal Budget has reduced the benefits of donating these flow-through shares to a charity once the shares or mutual funds holding the shares are listed on a designated stock exchange. The capital gains are no longer fully exempt from taxes for flow-through share agreements entered into on or after March 22, 2011. The Budget has reduced the benefits by limiting the exemption from capital gain tax to the extent by which the current fair market value of the shares or units exceeds their original cost base. In other words, a donor can now only claim an exemption from capital gains for the amount that the flow-through shares’ donated fair market value exceeds the original investment cost to the donor. Before the change in the 2011 Federal Budget, the government assumed nearly all the costs of the donation. With this change, a donor now shoulders a reasonable portion of the cost of donations. Again, Hope and Healing International’s policy is to only consider a gift of flow-through shares once they have become publicly-listed mutual fund units. Hope and Healing International’s policy is to consider these gifts on a case by case basis depending on how easily Hope and Healing International can value the flow-through shares for receipt purposes and/or how easily Hope and Healing International can sell the shares. Hope and Healing International reserves the right to issue a receipt with the date the shares/units are sold by Hope and Healing International and for the dollar amount Hope and Healing International actually receives on liquidation. Before you donate flow-through shares to Hope and Healing International, be sure to check with Hope and Healing International’s Finance Department at 1-800-567-2264 ext 224. 15. Once I’ve given a gift of securities, what forms will I need to use in order to fill out my taxes? Hope and Healing International recommends that you consult with your professional tax advisor when making gifts of securities. You will need to download or obtain a copy of the T1170 Capital Gains on Gifts of Certain Capital Property form. You will need to use this form along with Schedule 3 Capital Gains (or Losses) when you prepare your T1 General Income Tax and Benefit Return. If there was no advantage attached to your gift(s), there will be no income tax charged on any capital gains in your gifted shares, mutual fund units or income trust units. 16. What if I want to donate a paper stock certificate to Hope and Healing International? You can gift a stock in the form of a paper certificate. But first, you will have to ascertain that the stock certificate is still listed on a public exchange; otherwise Hope and Healing International will not be able to accept the gift as the gift cannot be liquidated and we cannot determine the value of the gift. If you have the shares in the form of a paper share certificate, it is important to follow the instructions on the back of it very carefully in order to transfer ownership to Hope and Healing International’s legal name “Hope and Healing International.”It is important that you send the certificate by registered mail to Hope and Healing International; or you can hand-deliver the certificate to our office. If you mail the paper certificate to Hope and Healing International, the official receipt value will be determined by the stock’s closing value of the post-marked mail date on the envelope. If you hand-deliver the paper certificate to a Hope and Healing International staff member or office, the official receipt value will be determined by the stock’s closing value of the date you hand-delivered the certificate to a Hope and Healing International staff member or office. Please note that upon receiving a paper stock certificate, Hope and Healing International will first have to make sure that the stock certificate is still listed on a public exchange, otherwise Hope and Healing International will not be able to determine the value of the gift or be able to liquidate the gift. 17. Disclaimer: Hope and Healing International recommends that before making any gift of securities of a significant size, a donor consults with his/her professional financial advisor(s) for the tax, financial and/or estate planning implications of making such a gift.